FX is developing a limited series based on Redshirts, the winner of the 2013 Hugo Award. 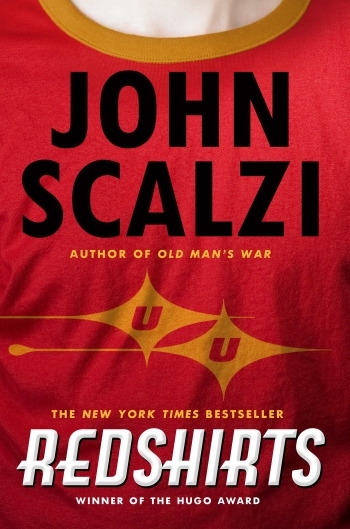 Deadline announced Friday February 7 that FX is adapting John Scalzi's novel Redshirts for television. Producer John Shestack, director Ken Kwapis, and producer Alexandra Beattie have signed on the for the project. Shestack's previous work includes Air Force One, Waiting... and Dan in Real Life. Kwapis and Beattie worked together on The Sisterhood of the Traveling Pants, and each has experience with television series. Kwapis directed several episodes of Malcolm in the Middle, and Beattie was a co-producer on Outsourced. John Scalzi confirmed on Twitter that he will be consulting on the show as well as being an executive producer. FX is currently looking for writers for the series. The novel follows Ensign Andrew Dahl, a new member of the crew of the Intrepid starship. Dahl and the other ensigns begin to realize that all away missions seem to follow a strange set of rules, including the death of at least one low-ranking crewmember. Redshirts was published in June 2012 and won the 2013 Hugo Award for Best Novel. The audiobook version is read by actor Wil Wheaton. No casting announcements have been made for the television adaptation of the novel, but given the novel's many homages to Star Trek and other well-loved science fiction series, we can hope that the producers will approach some sci-fi fan favorites. The novel and upcoming television series should not be confused with Redshirt, the comedy science fiction social networking simulator from independent developer Positech Games. The Escapist previewed Redshirt last July, and the game is now available for PC and Mac through a variety of digital distributors.